We've been lighting fans since day one, back in the days of KC's on a chrome roll bar in the back of a mini truck. But times have changed, and we've witnessed a serious evolution in light technology, power usage, and pricing. Today, it's possible to get something that puts out more light than your high beams, consumes less power than your stereo, is small and unobtrusive, and weighs less than the change in your ashtray. that said, we’re not light experts, nor do we aim to offer a comprehensive set of options. 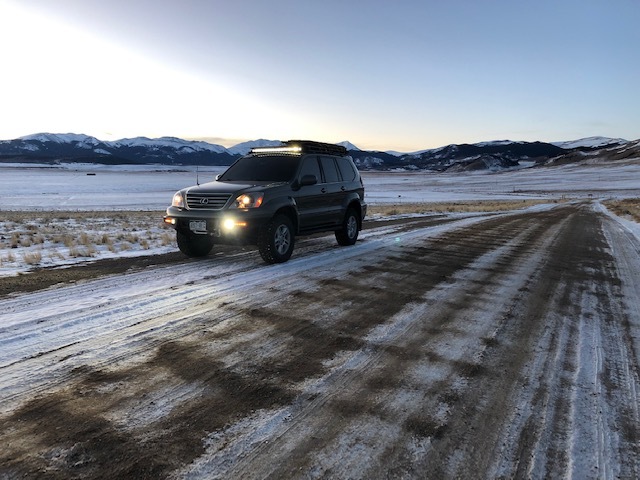 We instead simply offer the benefit of our experience, with what we learned from experimenting with several aftermarket lights over the years. What we've come up with is a set of products we've tested ourselves, continue to use, and feel bring you best balance of value and utility. These products are guaranteed to fit your Gamiviti rack. They are guaranteed to work well for at least a year. And they are in stock, available to ship right now, and can be packaged with your rack or towers making the shipping essentially free. Additionally, we can make your Gamiviti rack work with just about any light bar out there. 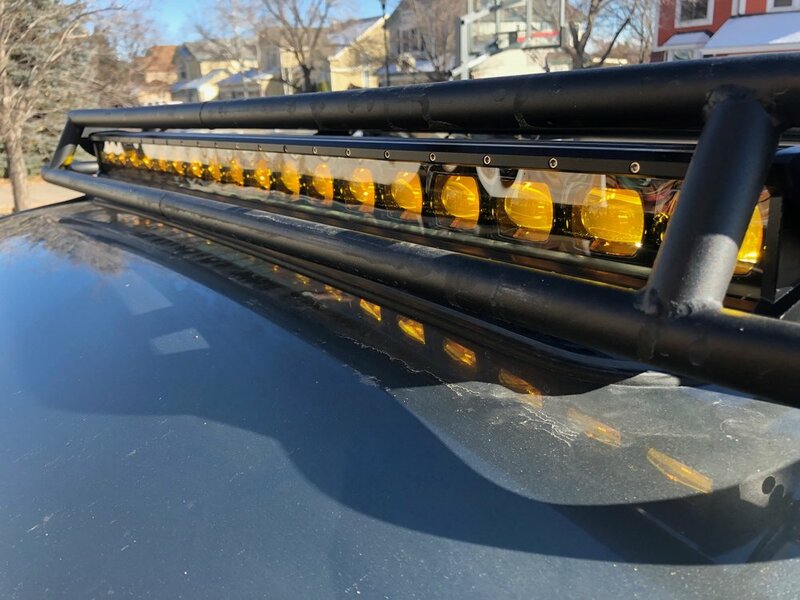 When designing your rack, just send us a link to the model of light bar you have, usually that is enough to get the proper dimensions and mounting locations. 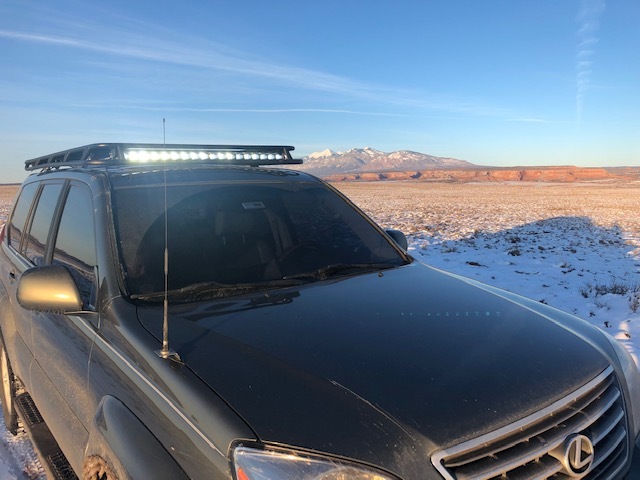 You can also send us your light bar, then have it returned to you with your rack. Additional costs may incur based on the complexity of you want, but it is almost all possible, here are aew sample images of both stock and custom solutions… click on any thumb for a larger version. 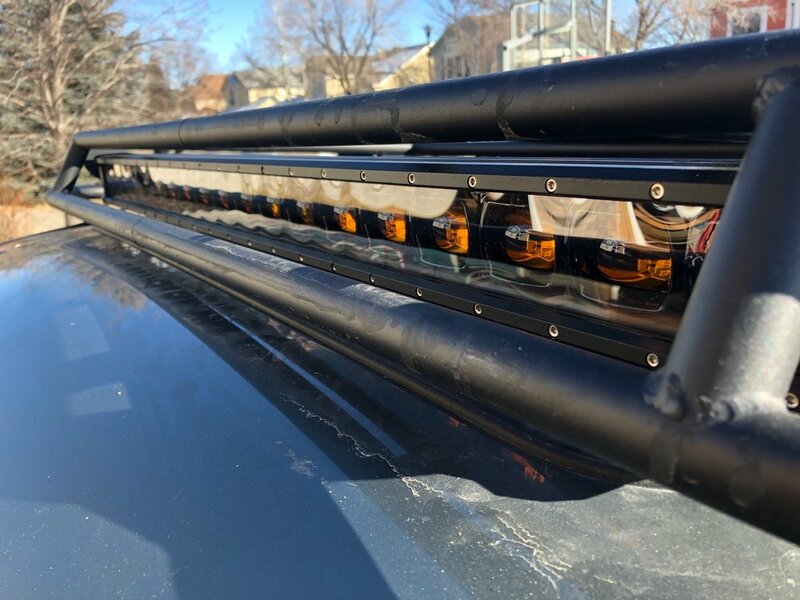 New in 2019, we now stock a 40” single row 180 watt light bar, available in both white and amber color. 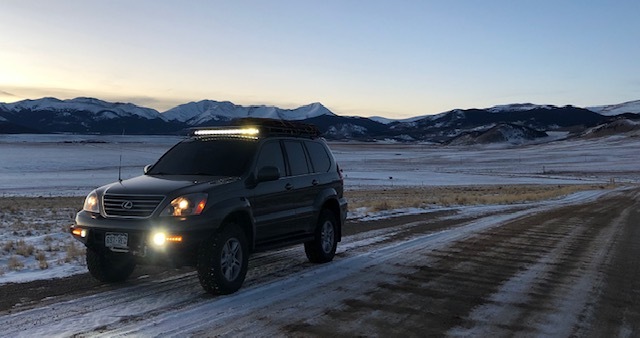 These light bars use 10w CREE LED’s, have an all aluminum housing rated to IP68 for waterproof, with sliding foot mounts, allowing you to mount these onto tabs of just about any spacing. 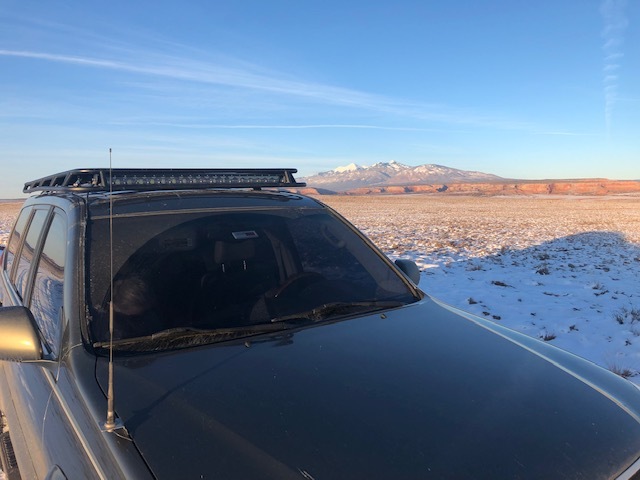 But to make these fit your Gamiviti rack even better, we’ve developed custom light tabs that position the light bar just below the rack cross bars, in the ideal spot inside your rack. 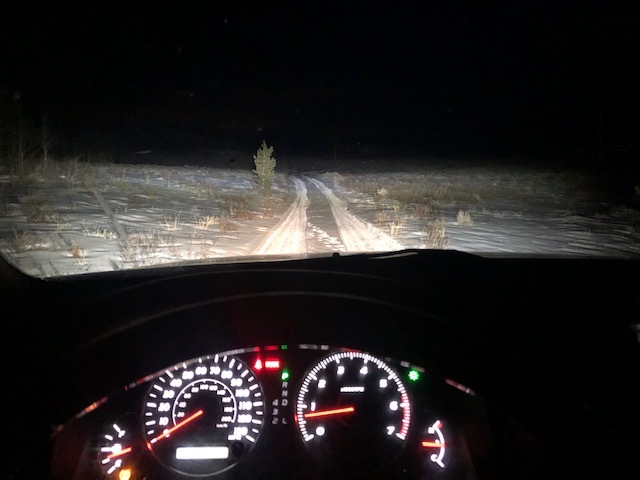 The beam pattern is more narrow that other common light bars, which combined with the adjustable tilting of the bar and mounts allows you to dial in the light to the exact position of your liking, and easily make adjustments if your terrain or vehicle position changes. Please specify white or amber when ordering, and remember shipping is free when we bundle this with your rack package. Our most popular light is the 18w reverse light, typically 2 on the back of the rack. The low profile means they can go underneath the rack, protecting the light while leaving the top open for gear. They can also be mounted on the side of the rack, providing a great solution for emergency or camp lighting. These even work great behind awnings, or behind your open hatch, as when it’s dark at camp you really don’t need a bright light blasting you in the face- there’s still plenty of light in the shadow for milling about in the evening. Mounted below the rack, these lights are out of the way all of the time, providing light when you need it. LED Power: 18W. Raw Lumen:1320lm. Operating Voltage: 10-30V DC. Waterproof rate: IP 67. 6pcs*3w high intensity Epsitar LED, flood pattern. Current draw:12Ｖ/1.4A；24V/0.7A. Color Temperature: 6000K. Housing Material: Die cast aluminum. Lens: Polycarbonate. Sold in pairs, $25. And shipping is free when we bundle this with your rack package. We also stock a light harness if you need a little head start getting your lights hooked up. These bolt directly to your battery, the switch triggers a relay which directs the power from your battery to your light(s). 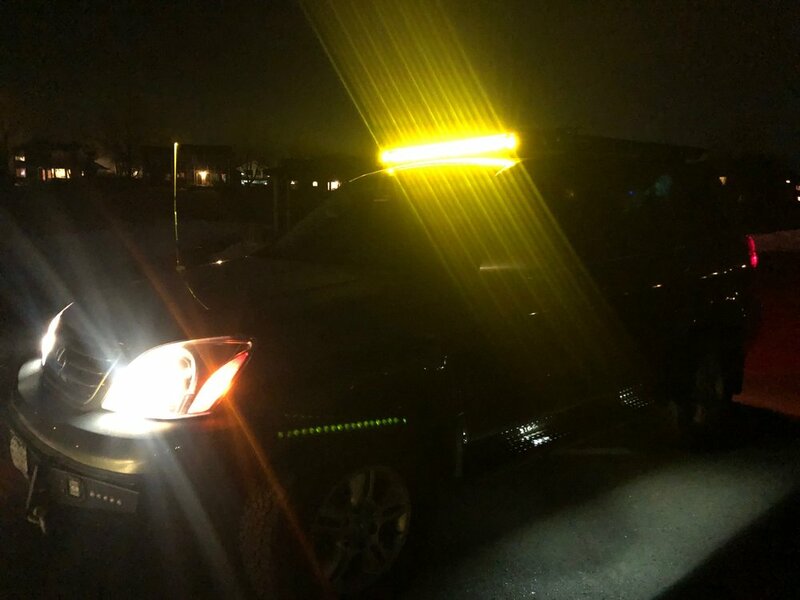 In most cases we install light bars and driving lights to the primary vehicle battery, and reverse/side/camp lights to the secondary battery, but either one works and a second battery is not a requirement. Harnesses are $25, and shipping is free when we add this to your rack package.